I couldn’t say how many times I’ve driven along the Lanchester Road or run along the railway lines from Broompark without realising that just a short distance away lay Witton Dene. 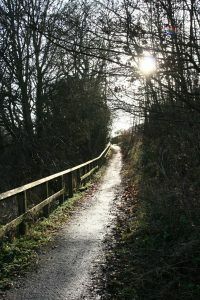 It’s one of the great attractions of County Durham that all over the region there are hidden pockets of tranquillity such as this just waiting to be discovered. Fran Mudd from the Wild Woods Project had invited me to run a winter tree identification session for the Friends of Witton Dene. These can be a lot of fun. Since identifying trees in winter relies a lot on twigs and buds, a good approach is to collect bundles of samples from the area, mix them up with a bunch of photographs, take them somewhere warm and dry, ideally with tea, coffee and an inexhaustible supply of jaffa cakes, then encourage everyone to have a look at them in comfort. Once the key features have been identified the new-found knowledge can be tested by heading outdoors and matching the samples to the trees. Some trees are easy to identify, and some aren’t. 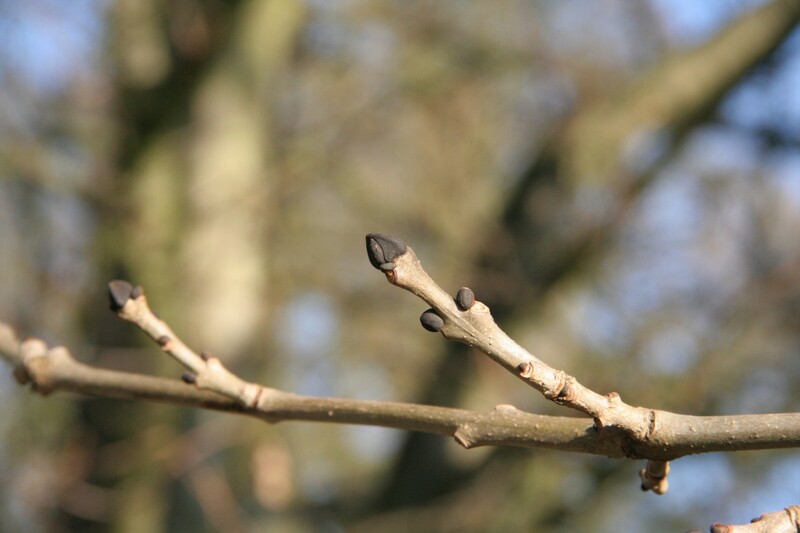 Some, like ash, can be easier to identify in winter than they are in summer as they have large, distinctive, sooty, ominous looking black buds in opposite pairs. They tend to be less conspicuous when the tree is in leaf. After our indoor session concentrating on the common species and their key features we headed outside for a wander and a quiz. It was a great morning but not without its puzzles. There was a question about Horse Chestnut. Not the usual question about how it got its name, but more about how it got its buds. Its sticky buds. Horse Chestnut (Aesculus hippocastanum) has large reddish-brown sticky buds in opposite pairs. They are particularly noticeable over winter. So why are they sticky? Good question. I didn’t know the answer and used the response I heard Chris Packham use in his talk at the Gala theatre a few weeks earlier. He’d been asked about a housemartin with hairy legs. Why did it have hairy legs? Who could say, but there would be a reason. It’s expensive to make a leg hairy, or a bud sticky, and an animal or tree won’t do it without a good reason. Hunting around, with assistance of the University of Google, was surprisingly fruitless. The question has been asked before and the hypothesis advanced usually involves predation; the tree protects itself from insects by trapping the insect on the sticky bud. It’s observable sure enough but doesn’t explain why lots of other trees manage to happily get through life without sticky buds. I’m sure there’s a reason, I just haven’t found it yet. sun-ripened buds on a sycamore? Why are these buds not green? The other puzzle I stumbled up on was the mysterious case of the sycamore with the reddish buds. During a visit in January I found a sycamore that had read the script and knew all the identification features it was supposed to have, except it decided to tint its southerly facing buds with a pinkish tint. 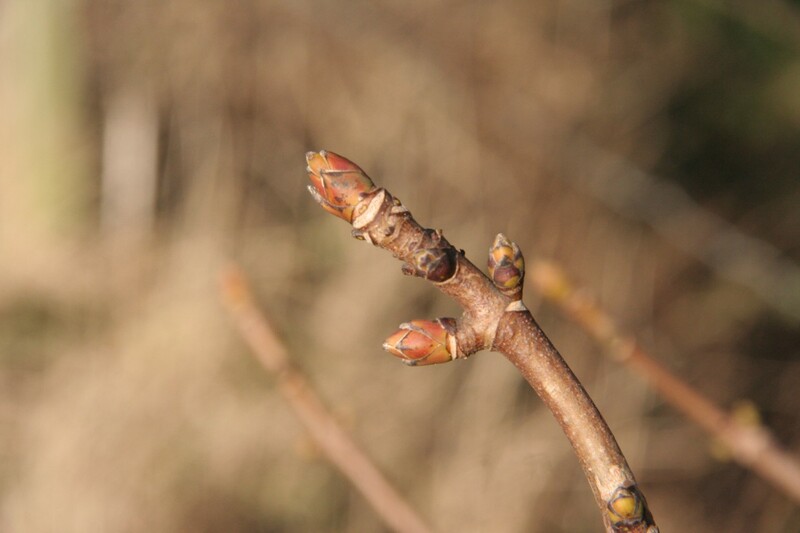 This is common in Lime trees where the buds exposed to sun often have a reddish glow where the shaded side remain green. But I haven’t seen it in sycamore before. The north-south facing divide in the colour is so marked that it’s the only reason I can think for the difference. 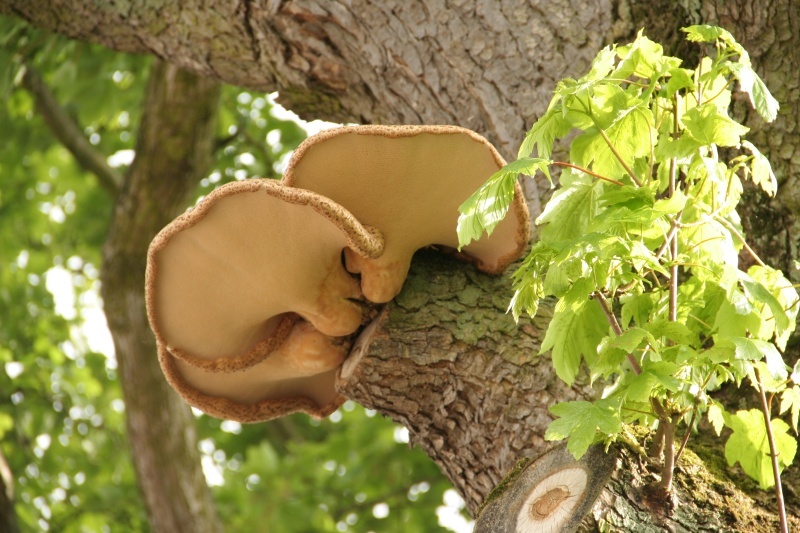 I frequently drive through Brancepeth on my way to Low Barns and recently I’ve been watching with fascination the unfolding drama of this bracket fungus. This is Dryad’s Saddle (Polyporus squamosus), also known as Pheasant’s Back Mushroom, presumably due to the distinctive surface of the top of the fungus that you can’t see in this photo. It’s fruiting from a pruning wound on a sycamore tree (Acer pseudoplatanus) next to the main road in Brancepeth. I’m passing this tree and fungus almost daily and watching with wonder to see if it’s just going to get bigger and bigger. Who knows, one morning I may drive by and discover it’s gone. Disappearing as suddenly and mysteriously as it arrived.